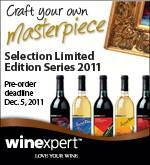 Elegant Wines – Winemaking Centre is the store for your Winexpert wine and beer making supplies. 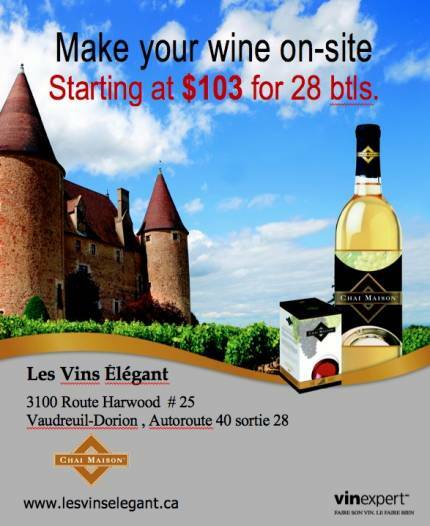 Elegant Wines has been in the Hudson Factory Outlets for 5 years now, a local store for Winexpert brand real grape juices for wine making, malts for brewing beer and one of over 40 winemaking oin the premises locations operating in Québec. The store has a vast selection of products and equipment for the amateur or experienced wine maker. We welcome you to our modern and clean wine store with our quality products and professional service. With a large variety of grape juices from Winexpert Vinters Reserve and Selection categories, consumers can easily make wine at home or in our store and we offer a 100% satisfaction guarantee. Winemaking on site requires approximately 45 minutes of your time over a 6 weeks period. Wine making and beer making equipment available on rental. Monthly specials new arrivals and hours of operation including holidays are always posted on our website and Facebook page. Selection International wines made with crushed grape skins. Selection International with Grapeskins is one of the most exciting and timely kits Winexpert has produced, allowing the winemaker to choose a country of origin kit with excellent varietal character, bold flavours and aromas and full-bodied tannins, all in a wine that drinks well young and rewards patience. 18 Litres in total – 16.4 litres of juice and concentrate and 1.6 litres of grapeskins. Reduce cost without compromising quality. Control the ingredients and substances your wine contains. Reduce the amount of preservatives. An environmentally friendly option. The bottles and the corks are recyclable.